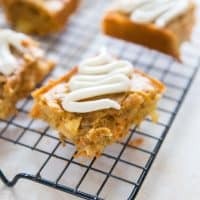 Super moist carrot cake bars are loaded with sweet bites of apples and topped with a simple cream cheese frosting! These bars are absolutely delectable! 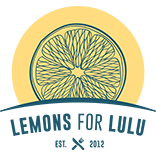 I’m proud to have partnered with Autumn Glory® to bring you this recipe. I don’t know why spring is synonymous with carrot cake. Last year I shared this Homemade Carrot Cake with Bourbon Buttercream and the year before, it was this Carrot Cake Trifle. Both desserts are rich, decadent and take a bit of effort, although the rewards are huge. 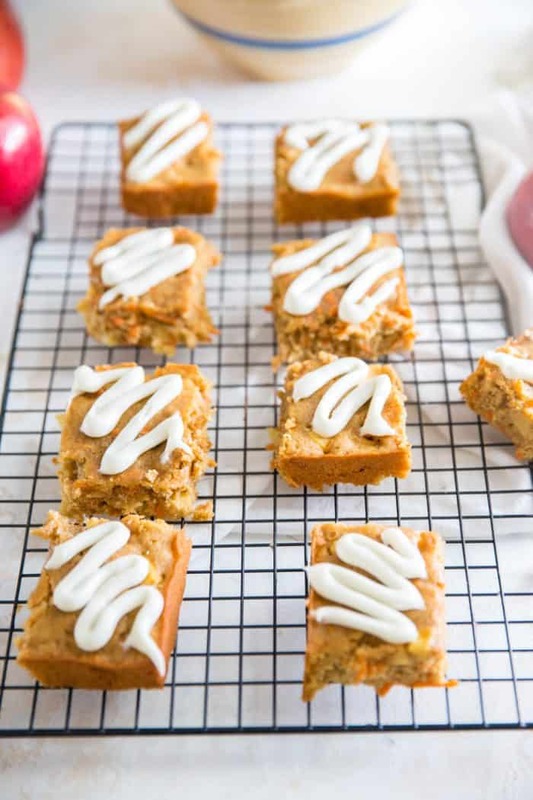 The best thing about the recipe I am sharing with you today, is these bars taste just as decadent, but they are made with wholesome ingredients! This recipe starts with eggs and brown sugar (just a 1/2 cup) which are mixed until combined. Vanilla, baking powder and cinnamon are mixed along with vegetable oil. Next is the flour. 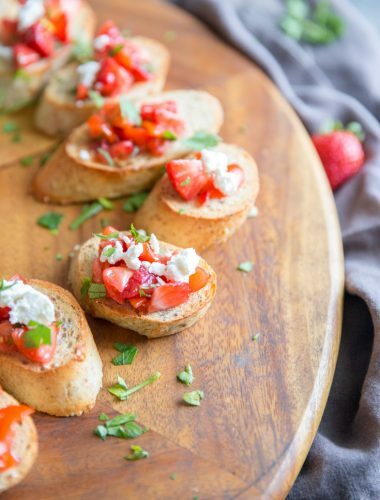 I used ivory or white whole wheat flour for this recipe. 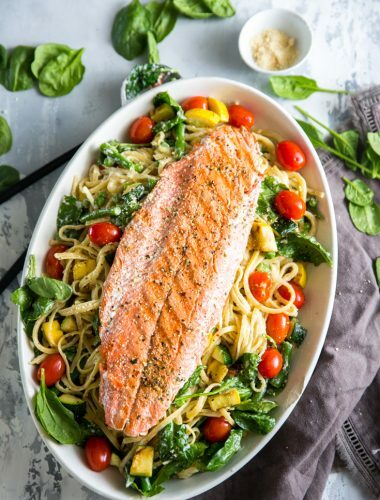 The white whole wheat is mild tasting compared to its whole wheat counterpart, yet it has all the nutritional benefits of your typical wheat flour. 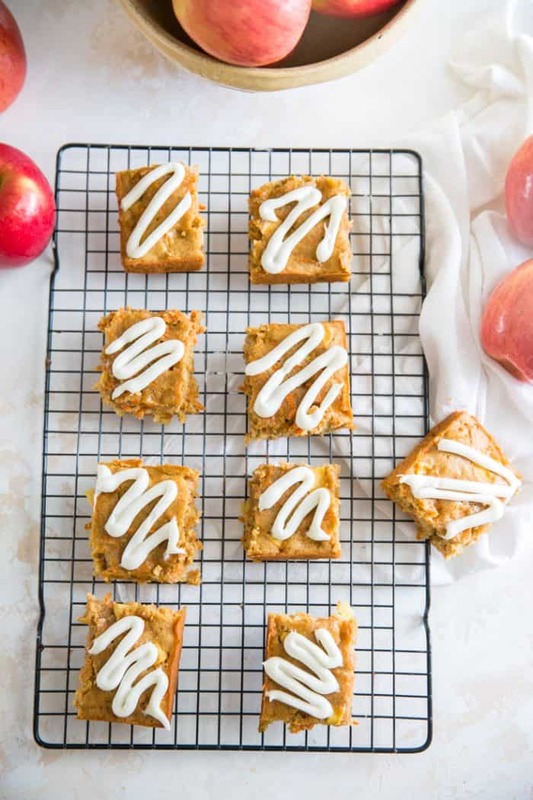 Shredded carrots (1 cup) and peeled and chopped Autumn Glory apples are folded into the batter. If you haven’t tried Autumn Glory apples, I implore you to try them ASAP! These apples have such a unique flavor as they magically taste like cinnamon and caramel all at the same time! 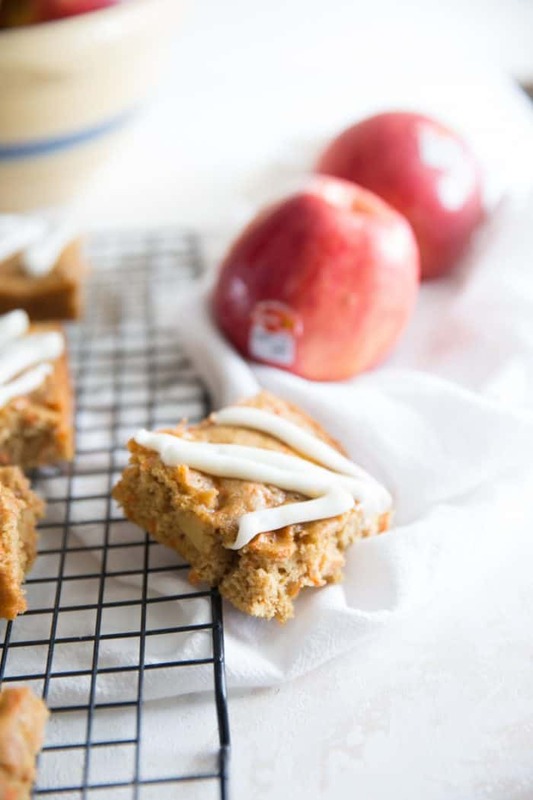 These apples were the perfect compliment to these carrot cake bars and these bars are the perfect dessert to showcase the flavor of these apples! 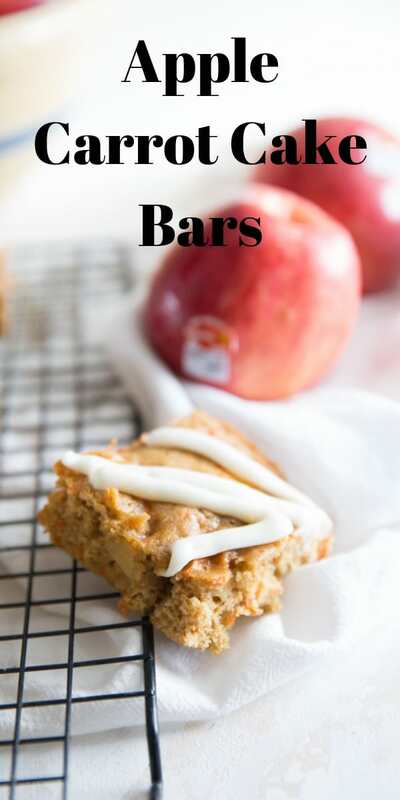 Not to mention, the apples help these bars retain their soft and moist texture. 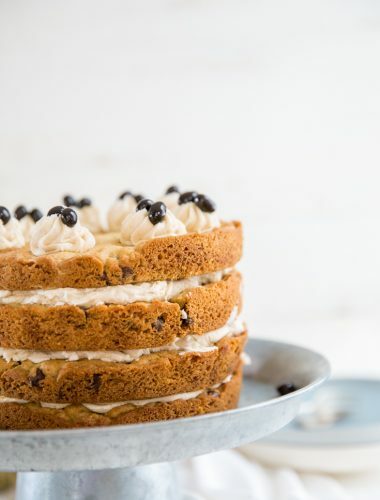 I’m not sure who decided that carrot cake and cream cheese frosting should go together…but they do! These bars are perfectly sweet and fine tasting on their own. I really consider the frosting optional. 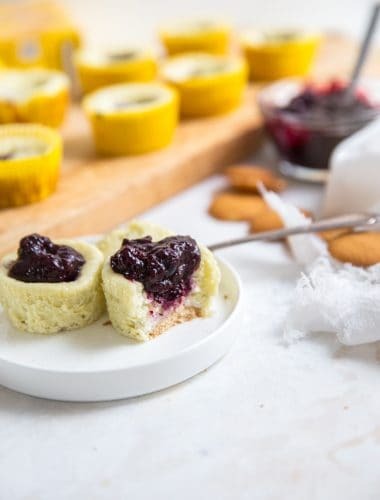 You could simply dust a little powdered sugar over the top of the bars and call it a day. 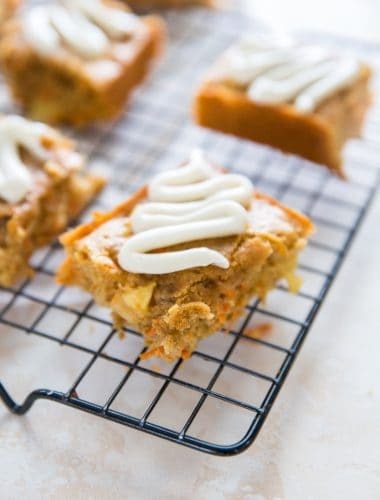 BUT if you want to transform these bars from a snack to a dessert a little cream cheese frosting is what you need. I used a scant 2 oz of cream cheese and a cup or so of powdered sugar to make my frosting. I chose to pipe a little frosting on each bar. 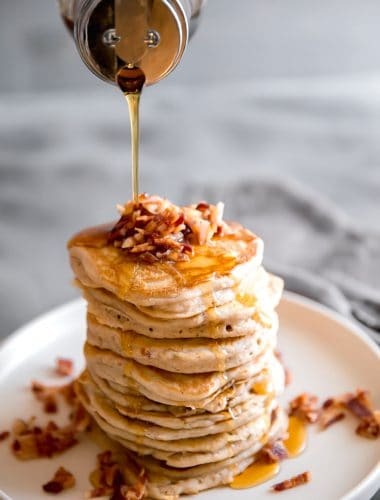 You could certainly frost the entire pan if you want. While I am talking about pans, this recipe will yield about 12 bars (baked in an 8 x 8-inch pan). 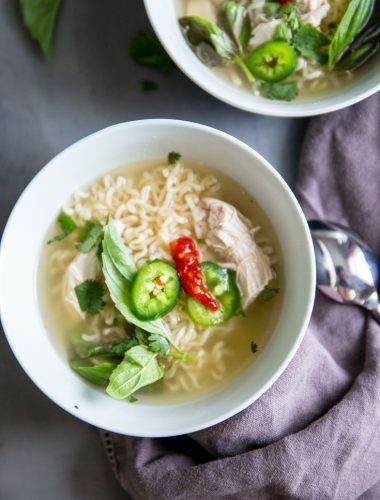 This recipe can easily be doubled, however. 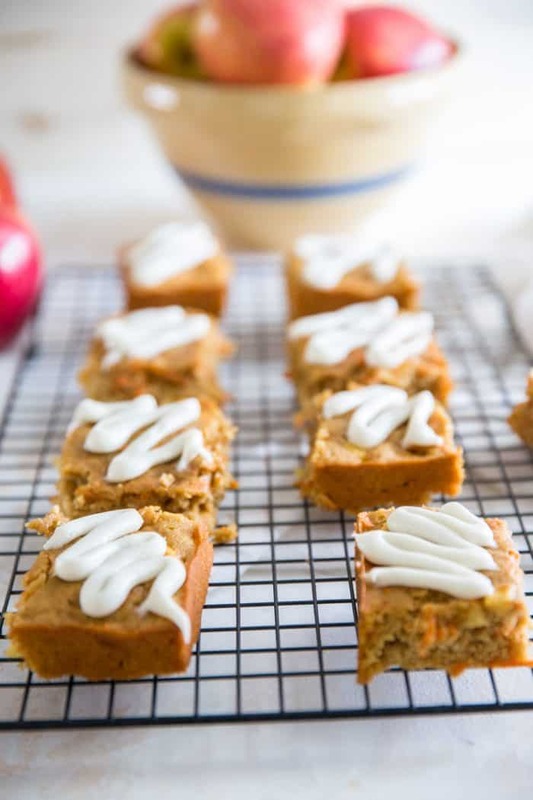 While carrot cake bars seem to be somewhat relegated to the Easter season, Autumn Glory apples are delightful all year round and should be enjoyed during any season! 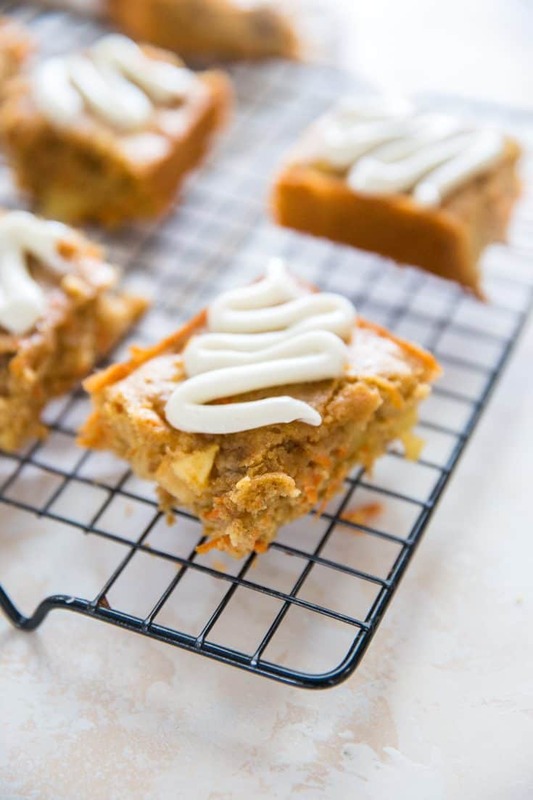 Soft and tender carrot cake bars have sweet apples in every bite! Leave these bars plain or top them with a creamy frosting for a more decadent treat! 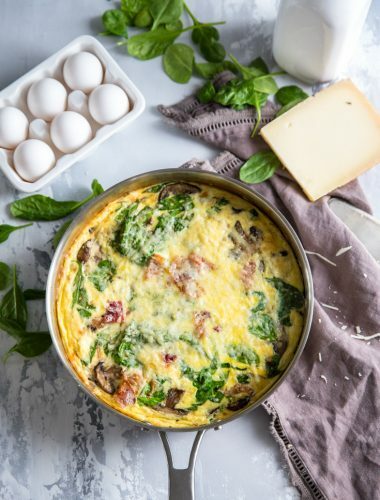 Spray an 8 x 8-inch pan with non-stick spray and set aside. In the bowl of a mixer, beat together the eggs and sugar until combined. Mix in the vanilla, baking powder, and cinnamon. Slowly mix in the vegetable oil. Add the flour and beat until incorporated. Fold in the carrots and the chopped apples. 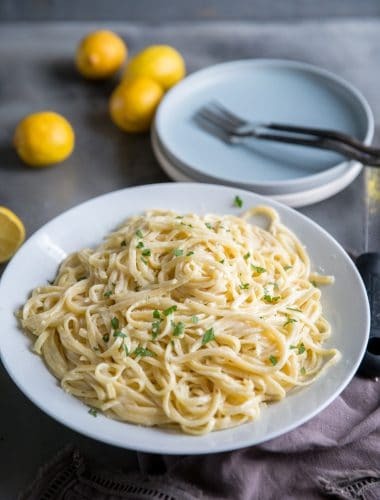 Pour the batter into the prepared pan and bake for 17 minutes or until a toothpick inserted comes out clean. Allow the bars to cool on a baking rack. 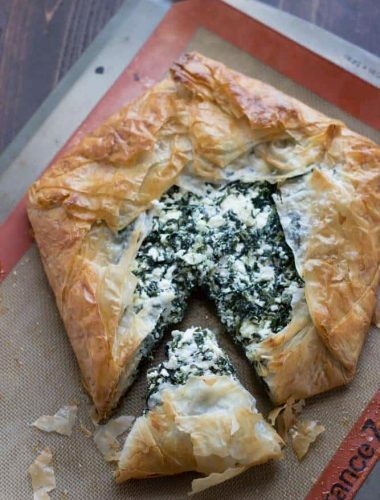 To prepare the frosting, beat softened cream cheese until creamy. Slowly beat in the powdered sugar adding in heavy cream until a piping or spreading consistency is achieved. Pipe or spread the frosting over the bars. 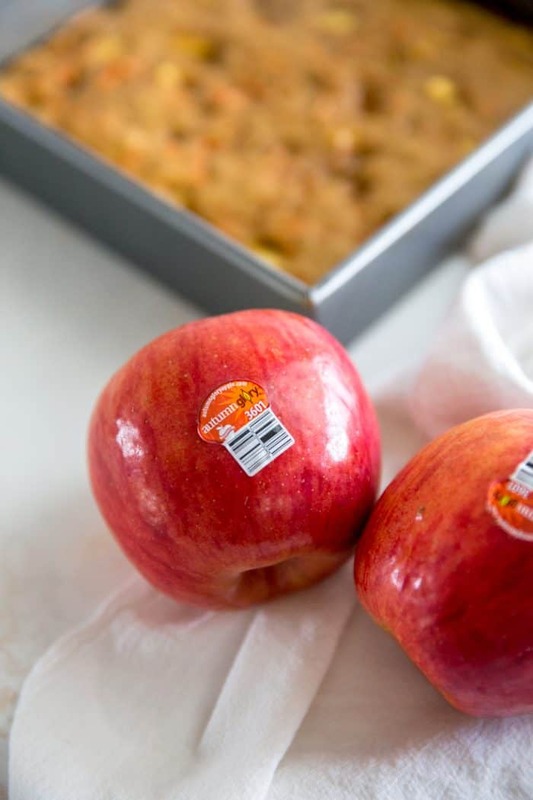 These bars are best stored in an airtight container in the refrigerator. I love this! 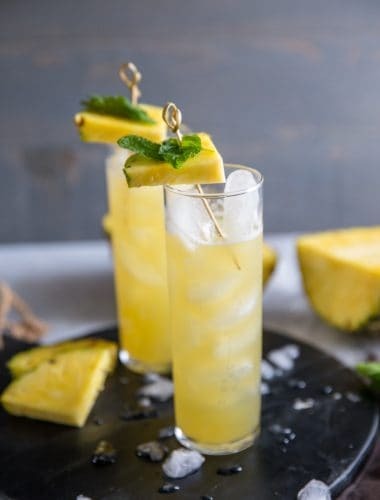 Amazing flavor combination!